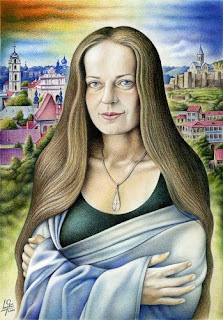 This portrait represents Diana Šileikaitė, a.k.a. Metalliana, a university teacher from Vilnius, Lithuania. She's the biggest fan of Georgia I've ever met, being a perfect example of the true friendship between our two nations. She actively supports everything Georgian in her homeland, helps Lithuanian students learn our language and speaks it herself fluently, with a lovely Baltic accent. We had the idea of this picture last year, after Diana's first visit to Georgia. Back home, she took some photos for the portrait and sent them to me, but I wasn't entirely happy with the material -- although, the mantle and the position of the hands, chosen by her, were perfect. On her second visit I took the photos myself and had everything ready to begin. I wanted to start working on the portrait as soon as she returned back home, but the same day she left the ill-fated August events started to develop here in Georgia. The Politika series, inspired by the war, postponed all my other projects, including Vilnius-Tbilisi (that's how we decided to call it). By the end of the last year the things a bit calmed down and I was able to begin the portrait, at long last. I managed to finish it right before my departure to Vilnius on December 29, and brought it with me as a gift. Diana and her parents liked it very much. The general composition of the portrait is inspired by the famous Mona Lisa. The background represents Vilnius on the left and Tbilisi on the right.